Using YouTube videos to promote your eBay listings is a great way to optimize them. This not only makes your eBay listings educational, but profitable as well. Product videos with complete information also lessens the chances of buyers messaging you. Getting messages is always good, but a well-informed listing is better. Instead of messaging you, your customers will go straight to buying the item. There are plenty of ways you can utilize videos to advertise your eBay listings. Among the best ways to do this is by including helpful product images and specifications on the video. Why is adding product videos to my eBay listings important? A good percentage of eBay buyers are using the eBay app. Save their time from scrolling by adding a YouTube video. Add a video that explains everything about the product. People are lazy. More often, they will want to watch something instead of read it. Embedding YouTube videos gives you the advantage to reach out to these customers. If your video is attractive enough, your buyers may consider placing your item in their shopping cart or wish list. This is good news since not only have you taken your buyer’s attention. You have captured their interest as well. Not all eBay sellers are willing to optimizetheir eBay listings. Some won’t try to adjust their listings to appease their buyers’ interests. Adding an eBay product video will set you aside from the rest. Buyers find eBay listings with product videos more competitive than the others. Your efforts to make and add a video gives you an edge other sellers don’t and won’t have. So do your best to stand out by adding eBay product videos that translate to sales. You may add not just one product, but multiple products on your videos. This gives your potential buyers a chance to look at your other products. How do I add YouTube videos to my eBay listings? Choose between creating and embedding a pre-existing video. If you chose to shoot your own video, draw a storyboard to act as a script. Use it as a cheat sheet for when you shoot your product video. If you’re not going to use graphics that need a storyboard. List down the things you want to highlight about the product. Set up your shoot with an ample amount of lighting. Use enough space for you to move your camera around. You can choose to use pictures for the product video. When you do, use helpful text to describe what you’re trying to point out from the pictures. It’s also a good idea to shoot your own photos. This adds a personal touch as well as a better look at the product sans the professional editing. Be your own salesperson. Instead of relying on text and graphics, create your own voice-over. Speak in your calm, clear, and professional voice. If you’re confident enough, you may even show yourself in the footage. Upload your video on a free sharing website. The best website to this is on Vimeo or on YouTube. As long as eBay supports it, try it. Embed. Embed your video from YouTube by clicking the “embed” button. Copy the embed link by pressing CTRL + A then CTRL + C.
Create an eBay listing. Create the eBay listing that matches the details on your product video. Add your video to your eBay listing. You can do this by switching to your listing description’s HTML tab. Scroll down to the very bottom of the screen and paste the embedded link to your video. Make final touches to your eBay listing. Before saving everything, finalize all that needs adding and editing. Once you’ve made your eBay listing live, you’ll find your product video where you embedded it. Are there any limitations to adding YouTube product videos to my eBay listings? Embedded videos from other sources on YouTube may show related videos of the same product. This can potentially take your customers’ interest away. If you uploaded the video yourself, you may disable ads from your eBay videos. YouTube runs with Flash. Potential buyers with computer or devices that don’t have the Flash plug-in won’t be able to play your YouTube product video. YouTube has a limitation to video files being uploaded. Most accounts only have a limit of up to 15 minutes per video. But if the need arises, you may increase the limit by verifying your account. Once your account has been verified, you may be able to upload videos more than 15 minutes long. The maximum video file size allowable on YouTube is 128 GB (as of November 12, 2016). If your video is larger than this, it’s almost impossible to upload. What you can do is either shorten your video, save it a smaller file size, or cut your video into several parts. What are the important things I need to remember when adding eBay product videos? After shooting your photos or video, it’s time to touch them up. Use free editing software to cut down on costs. But if you aim for a more professional look. Buy professional editing software such as those from Adobe. If you don’t have the necessary skills, you can always hire a professional to do it for you. Hiring someone local is often more expensive than hiring someone online. Try outsourcing the editing job to freelancers willing to go beyond what you expect at a lower price. Make sure to add relevant texts such as product information and manufacturer details. Create graphics that engage customers, not distract them. This is to help them stick to the main objective of the video. Use appropriate music. Avoid using music with vocals especially if you’re speaking in the video. It’s distracting and unnecessary. Adjust lighting especially if your footage is to dim. Advertise your eBay store. Stick to eBay’s link policies to avoid any issues. YouTube has their own set of policies when it comes to uploads. eBay only accepts embedded videos from YouTube. Create a YouTube account using your eBay store email. This creates a more professional look and feel for your product videos. YouTube has different upload times for different file sizes. For example, a 6-minute video may take 3-4 hours to upload depending on your internet speed. If your file is too large, you can always export the raw file with a lower, more standard quality. Follow eBay’s link policies for adding product videos to prevent any issues. Always remember that increased attention translates to increased probability of sales. All you need to do is decide whether to copy or create your own product videos. Try A/B testing for your duplicate listings using the videos you uploaded yourself. This way, you’ll know what style of video presentation your potential buyers prefer. Check this by going over the view count of your YouTube videos. Linking YouTube videos that you didn’t upload yourself won’t give you accurate results. So opt to make and upload one for yourself. Not only will you be able to get an accurate view count, but you may brand your videos as well. Include eBay store logos and other necessary product details. Do you have other eBay video tips you’d like to share? If you do, please feel free to share them in a comment below. For more eBay and YouTube tips and tricks, please visit our blog today. We have some amazing eBay Tools for you INSIDE. 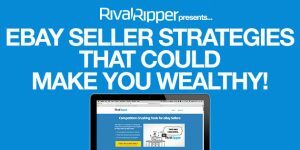 "For our new friends, Rival Ripper is an eBay listing management platform that combines template building, message tracking, order management, and pricing all into one powerful tool. To learn more about Rival Ripper and get insider access, sign up for our 100% free newsletter." We value privacy. No spam. No worries. 7 eBay Seller Strategies That Could Make You Wealthy! © All Rights Reserved. 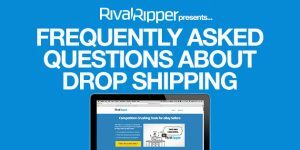 www.rivalripper.com.